Usec. Lisa Grace S. Bersales delivers Keynote Speech during the POPCEN 2015 Provincial Data Dissemination Forum of PSA-Tawi-Tawi. “The quote ‘better data, better lives’ has been embraced by the international arena,” Usec. 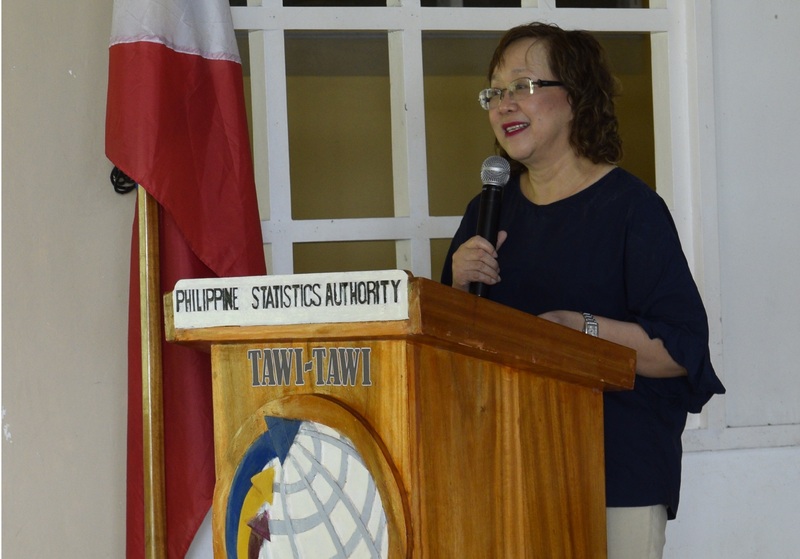 Lisa Grace S. Bersales, the National Statistician and Civil Registrar General of the Philippine Statistics Authority (PSA) said in her Keynote Speech during the Provincial Data Dissemination Forum on the Demographic and Socioeconomic Characteristics of Tawi-Tawi based on the results of 2015 Census of Population last January 10, 2018 in Bongao, Tawi-Tawi. Usec. Bersales highlighted the importance of data and accurate information for the social and economic development of the country, most especially of Tawi-Tawi. She cited three major national and international efforts in achieving a better life for the people, namely the Civil Registration Vital Statistics Decade (CRVS Decade), Sustainable Development Goals (SDGs) also known as Global Goals, and the AmBisyon Natin 2040 of the Philippines. PSA also plays an important role in monitoring the realization of the Global Goals. According to this project, by 2030, the planet earth and all its people will achieve peace and prosperity and this will be achieved through partnership. Usec. Bersales hopes that Tawi-Tawi will be able to experience this transformation through the available data of the PSA and other data sources. She also encouraged the data partners to build strong coordination with the PSA and give regular feedbacks towards the data results generated by the agency. According to Usec. Bersales, about 10,000 young Filipinos were asked how they want their lives to become in 2040. Results have shown that Filipinos want to have comfortable lives where they will be able to travel for leisure and build strong bonds with their families and friends. With this, the AmBisyon Natin 2040 was crafted by the National Economic and Development Authority (NEDA). This will serve as the long-term vision of the Philippines that will anchor the development plans of about five administrations in the country. These three goals shall be felt by the people of Tawi-Tawi. Usec. Bersales emphasized the commitment of PSA in providing solid information to the planners for them to be able to give the appropriate interventions to the people. Thus PSA needs to partner with the stakeholders to assure that the efforts of the government are maximized and indeed the best for the people.